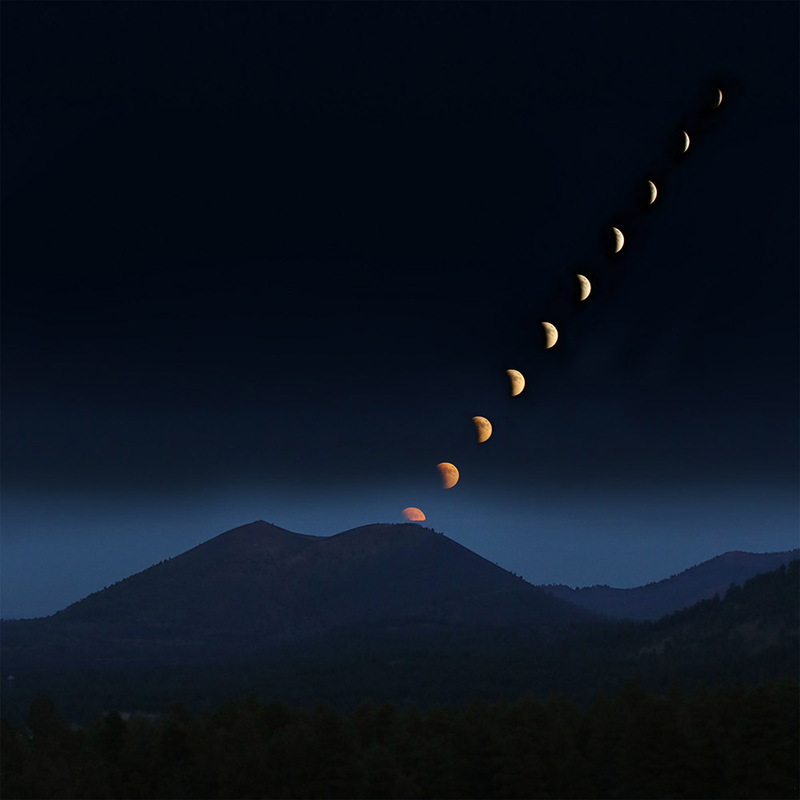 Flagstaff Photographer Mark S. Haughwout is also a Photography skills teacher offering private photography workshops. In this picture above I captured a sequence of 10 photos and merged them in Photoshop. First scout a location for a pleasing landscape feature and using a GPS and computer figure out where to stand to get the proper angle. The moon rises in different locations every night. This night it rose at 97 degrees (2 degrees south of due east). Equipment: Canon 6D Lens: EF70-200mm f/2.8L IS USM open to 73mm. Gitzo Tripod and Shutterboss remote shutter release. For this shot I had AWB on, but picking a preset white balance is better. Turn OFF the lens IS (as with anytime the camera is fixed to a tripod). I also had the camera in portrait orientation to try to get more shots of the eclipse, but ended up cropping square. Set the Shutterboss to take a picture every 5 minutes to get the distance between the moons you see in this picture. Notice that I used a fairly fast shutter-speed, this is to offset the effect of wind shaking the tripod and camera. Raising the ISO would have allowed me to change to a smaller f-stop. However I do not recommend going beyond f8 or f11. Most lenses are sharpest about 2 stops closed down from wide open. Since we aren't worried about depth of field, there is no reason to exceed f5.6. After making sure the layers are in order, I started by erasing unnecessary ares from each of the layers the moons were on using the eraser tool. After that I used the layer mask feature on the first three layers (the ones that still had light from the setting sun). Finally, I saved the image as a JPEG. Afterwards adjustments in size and brightness for the web can be made. Notice the difference in the sky in each picture above. The same camera settings were used in all of the photos. The photos were taken as the sun was setting behind me. I used a circular screw-on gradient filter that tappers off at the middle of the image. A better method is to use a square filter in a filter holder. These can be moved up and down to adjust were the effect ends. This gradient filter is rated 1.2 (equal to 4 stops). I also own a 0.9 (3 stops). I do not recommend buying a 0.6 or 0.3. Brand: Formatt Price: $135 from BHphoto. Notice the change in White Balance in the pictures due to the Gradient Filter tricking the Canon 6D AWB (Auto White Balance) setting. The Gradient Filter does not affect the bottom half of the pictures, but the AWB chose a warmer setting based on the whole picture. 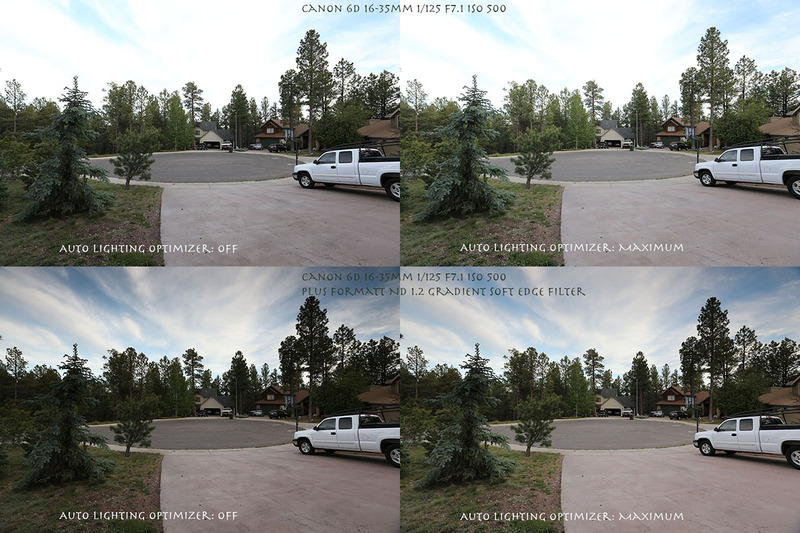 The Auto Lighting Optimizer (ALO) on my Canon 6D was set to maximum (3 bars). This really brought out the shadow detail in these JPEGs. For example notice how the ALO lightened the areas in the trees and grass to get more detail. The ALO does not affect the RAW files, but it works really well when you are shooting JPEGs. HDR became popular some years back, but with today's excellent sensors, a single RAW file can usually produce similar stunning results. HDR is basically a process of taking multiple pictures of the exact same thing with different exposure settings and then combining them into one file. What this does is give the Photographer or Photo editor more latitude with adjustments to the image. This can be great for high contrast scenes. The new HDR image will have enough information in the highlight and shadow areas to allow for bringing out details in those areas. However, today's RAW files already have plenty of info for most situations to deal with shadow and highlights, especially if the photographer errs on the side of under exposure. It is important to not blow out the highlight areas (If any part of the picture - especially the sky - is pure white, it cannot adjusted since there is no information there). The photograph on the left is an unprocessed RAW file. No adjustments were made. The photograph in the middle was opened in Adobe Camera RAW and then I only pushed the Auto Adjustments button which affects lighting. Notice all the detail that was available in both the shadow and highlight areas. The photograph on the right got additional adjustments of clarity, vibrance, saturation and sharpening. I also hit the lens correction button. All the photographs were then saved directly from Adobe Camera RAW as JPEGS without opening in Photoshop. Next I opened the JPEGS in Photoshop to shrink them and compress them further in order to make them fit this web page and load quickly. For HDR I need a completely still subject, however the wind was blowing causing not only the bride's hair to blow, but also swaying the couple slightly. 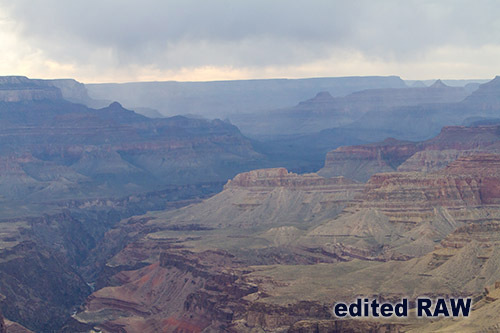 To accomplish the look in this picture I used the adjustment brush to select just the Canyon and then improve the lighting and detail only in that area. All of these photographs were saved as JPEGs, but this one had to be further compressed in Photoshop's Save For Web feature, otherwise it would be about 8 times larger in file size. The advanced editing in Adobe Camera RAW resulted in a huge JPEG file compared to the basic editing in the first three wedding photos above. I personally have no use for HDR. I can get similarly stunning results out of a RAW image with a lot less work and none of the fake look that HDR images are prone to have. IF you insist on HDR, only use it on a still scenes with no people or movement in it. Be sure to have a tripod and remote shutter release. As you can see the JPEG file above lacks the shadow detail of the processed RAW versions. The bride and groom also appear darker. However this JPEG is much better than the UNPROCESSED RAW file. So if you don't want to take time to process RAW files, it is best just to shoot JPEGs. Incidentally I did have the Auto Lighting Optimizer on my Canon 6D turned all the way up for this JPEG. If I didn't use the ALO, the JPEG would be even darker in the shadow details. The JPEG version is still a nice picture, but it is not fantastic like the highly processed RAW file above. As a Photo Editor I could have worked with the JPEG file to bring out some more detail in the shadow area, but I just couldn't push it as far as the RAW file. And besides, if I'm going to take the time to do such editing, I might as well have the latitude that a RAW file offers. 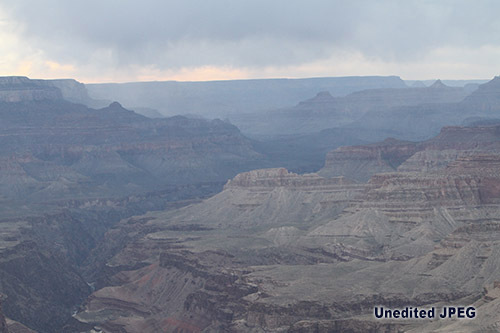 If you enlarge the photos above on your computer screen, you will notice banding in the sky of the JPEG file that does not happen in the first three RAW files. (It does happen some in the last version of the RAW file because I over compressed it for the web). Finally, before someone calls me out on it.... ALL of these pictures above are now JPEGS, it's just that the first 4 started out as RAW files. Okay, Okay, already! That's not true either... technically they ALL started out as RAW files, but the last one the camera turned into a JPEG before recording it onto the memory card! If at this point you are thoroughly confused, you should probably just shoot JPEGs! At least until you contact me for a private photography workshop. Here is another example of the advantages of shooting in RAW. The first version is the unedited JPEG capture, the next picture is after editing the JPEG. The final picture is an edited version of the RAW file. These three pictures are just versions of the same photograph. 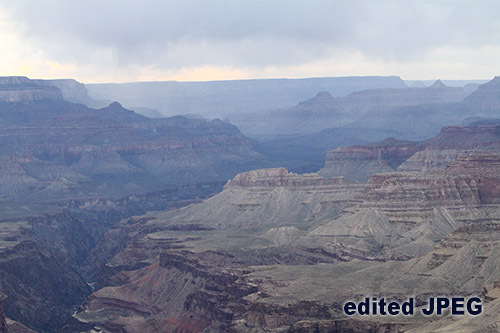 I took this photograph near Lipan Point in the Grand Canyon on a dreary, rainy day. I took the photo with my Camera set to record a Large JPEG and a Large RAW file at the same time. I edited the JPEG and the RAW file in Adobe Camera Raw. As you can see, I was able to make the colors much more vibrant by editing from the RAW file. I was also able to reduce the noise in the photo better from the RAW file as well as performing better sharpening. If you are going to do heavy editing on your photos, I highly recommend shooting in RAW. When I photograph outdoor weddings, such as a wedding at the Grand Canyon, I shoot in both RAW and in JPEG. I save the RAW files for editing and use the JPEGS for client proofs. RAW files are about 3x as large as L-JPEGS and are therefore more difficult to transfer, take more drive space to store and are impossible to send via email. RAW format is completely unaffected by camera settings such as the ALO discussed above or by White Balance settings. A RAW file is only the information gathered by the camera sensor BEFORE being processed by the camera computer. JPEG files on the other hand are compressed versions of RAW files and are affected by all the camera settings. JPEGS are great for snapshots. Professionals also shoot JPEGS for sporting events, weddings and other situations where large numbers of pictures will be taken. This is perphaps the most misunderstood aspect of today's DSLR cameras. A 'bit' has a value of either 0 or 1. Thus a 1 bit photo has only two colors: pure black and pure white. The number of colors that can be recorded by a camera is 2 to the power of the bit number. A sixteen bit photo has this many colors: 2^16 or 2x2x2x2x2x2x2x2x2x2x2x2x2x2x2x2 or 65,536 per channel (Red, Green and Blue). Canon DSLRs shoot at 14bit per channel thus 42bits total or almost 4.4 TRILLION colors! Sony also shoots at 14bit in uncompressed RAW but for Compressed RAW, it compresses it down to 11bit - less than 8.6 Billion colors. In other words a Canon RAW file can have almost 500x more color info than a Sony compressed RAW file.... in theory. 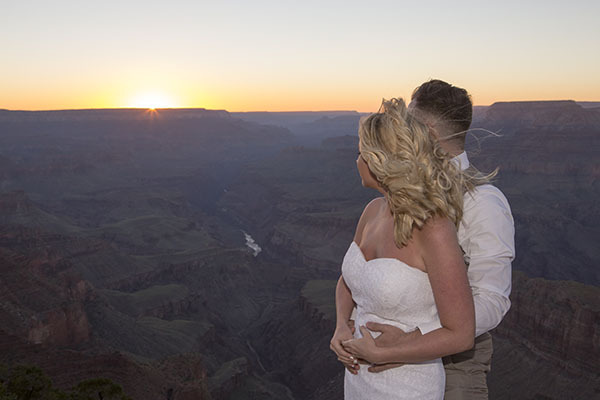 But having more color information allows for more ability to manipulate the photo in editing programs, provided that you edit in 16bit and in ProPhoto setting (not in sRGB or Adobe RGB).